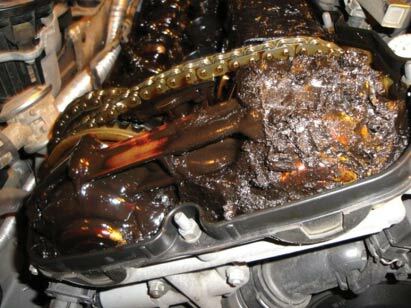 Sludge is a real threat to your engine’s life. The longer you go between oil changes, the more potential there is for harmful deposit build-up inside your engine. This point was illustrated in 2002 when Toyota addressed oil ‘gelling’ in 1997-2002 model year vehicles. Oil gelling can occur in any vehicle when oil change intervals regularly exceed factory specifications. In order for fresh oil to do its job effectively, the engine should be cleaned in a safe and gentle procedure. Dissolving soft sludge or “gelling” provides a clean environment for new oil. By running an Oil System Cleaner through your engine before the oil is changed, contaminants are flushed from the engine and are trapped in the oil filter or they are suspended in the dirty oil. The dirty oil and oil filter containing the contaminants flushed from the engine are removed during our full service oil change. When purchasing a used vehicle – Was your used car babied by its previous owner? Car history companies and the DMV can tell you about major infractions the vehicle has been in but it is often very time consuming to piece together. By running an Oil System Cleaner, you can start with a clean slate. Before using synthetic oils – Synthetic oils are designed to excel in modern engines with tight tolerances. When oil passages become fouled with varnish and sludge, oil cannot flow efficiently. This compromises heat dissipation and lubrication in hard-working engines that should use synthetic lubricants for optimum performance. Using engine additives – Most engine additives work by bonding to metal surfaces inside your engine. If the internal parts inside your engine are coated with built up sludge, varnish, or contaminants, that expensive engine additive will remain suspended in the oil and fail to do its job. The Oil System Cleaner is added when your car pulls into our service bay. The liquid is added to your motor oil and the engine must be run for up to five minutes to thoroughly circulate throughout the engine.